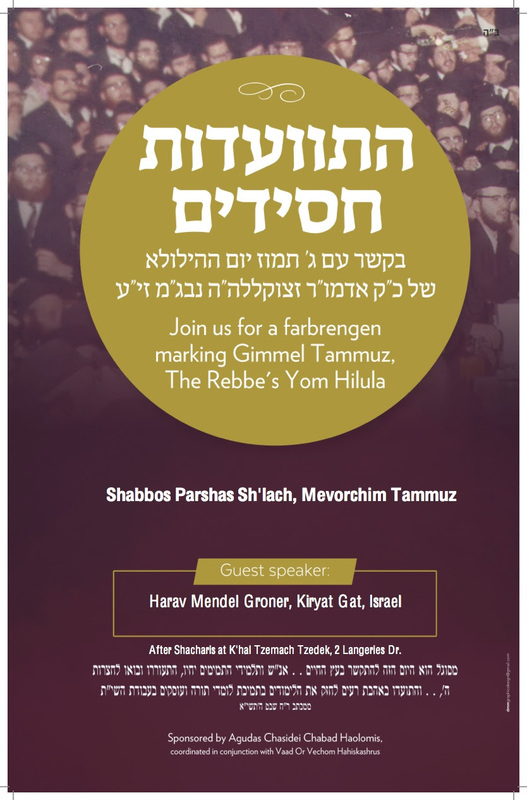 This Shabbos, Shabbos Mevorachim Tammuz, Tzemach Tzedek is honored and excited to welcome special guest, Rabbi Mendel Groner of Kiryat Gat, Israel (son of the Rebbe's secretary, Rabbi Leibel Groner), who will speak before musaf and also farbreng with us at the kiddush in preparation for Gimmel Tammuz. Please join us for this very special, uplifting Shabbos. 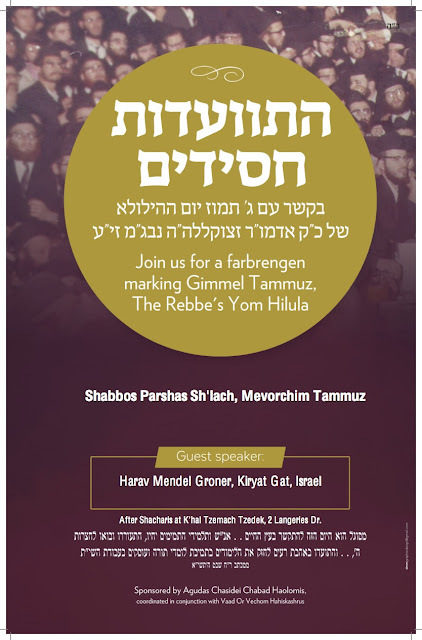 As Shabbos Mevorachim blesses, and is therefore connected to, the entire month of Tammuz, Chodesh HaGeula and the awesome days of Gimmel Tammuz and Yud-Bais/Yud-Gimmel Tammuz, all are invited to take part in sponsoring this special Shabbos and farbrengen, and all of the brochas connected to it. As the saying goes, what a farbrengen can accomplish, even Malach Michoel can not. To become a sponsor, please contact Avraham Hayman at 845-269-1787 or avrahamhayman@gmail.com.